We were lucky enough to be asked if we would like to try out the new deep crust pizza from Papa Johns. 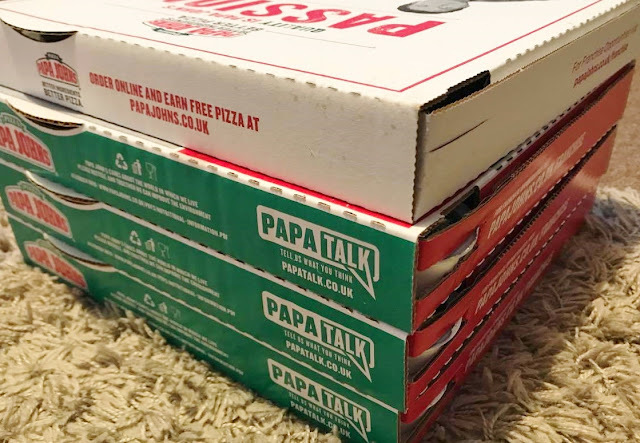 I have to admit, I'm a massive pizza lover, so for me it was a no-brainer, I couldn't wait to try out the new base, as we are already fans of Papa Johns due to the fact it is the only takeaway local to us that does a thin crust cheese and tomato pizza. 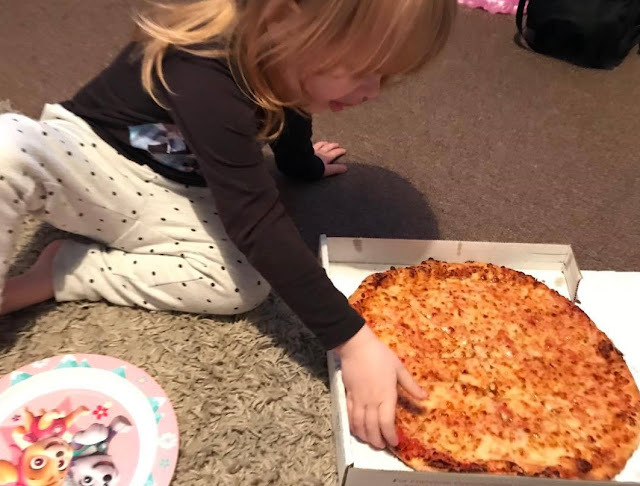 Emily was so excited to be having a pizza party with some family members, It was a lovely Saturday night, topped off by the fact that we had just got back from holiday and I didn't have to cook. We hadn't actually had the chance to go shopping yet, so not only did that save me a job it also meant I got to catch up on the washing that really needed doing. The Papa's Deep Crust is almost double the depth of a regular pizza and is cooked in a specially designed pan. They pride themselves on using fresh ingredients, ensuring the use of fresh never frozen dough. The specially formulated recipe features a buttery, seared crust for a fuller flavour and a light and fluffy deeper dough, almost double the depth of regular papa john's pizzas. It also features a specially developed tomato sauce which was created using Californian vine-ripened tomatoes which go from field to can in six hours. Added to this is a blend of signature spices and extra virgin olive oil which are then reduced to create a richer tasting sauce, complementing the new thicker base perfectly. Every 'Papa's Deep Crust' pizza uses an extra cup of cheese, which is spread all the way to the edge of the dough to create a caramelised, crispy cheese crust. Each pizza is then completed with all the favourite pizza toppings, including fresh 'store cut' vegetables. We sampled three different toppings, The greek, which is a vegetarian pizza which is Mediterranean inspired, with a combination of crumbled feta cheese, sliced red onion, fresh tomato, black olives, sliced pepperoncini and mozzarella with an oregano sprinkle. 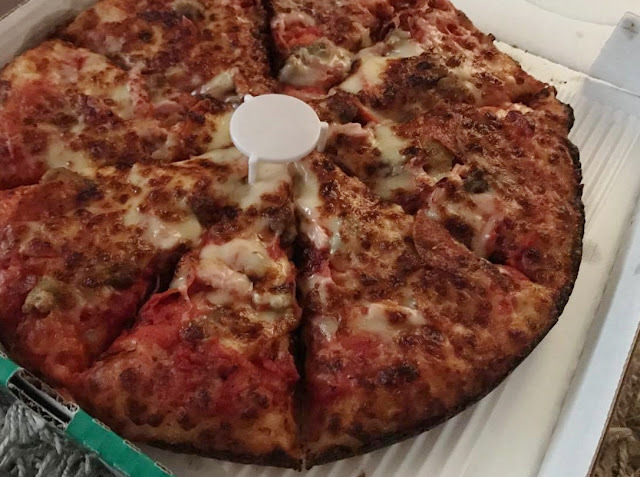 We also were sent a double pepperoni pizza, which is actually Sam's favourite, and my favourite which is all the meats - this was actually voted they're all-time number one all-time pizza by Papa John's fans. The topping is pepperoni, sausage, crispy bacon, spicy beef, chunky ham and fresh mozzarella cheese - a pizza I would definitely recommend. We were really impressed with the new deep pan, and from now on we will be buying that base, the pizza was more filling and unlike other deep pans I have had in the past it wasn't dry. Emily did try some but she said she still liked her thin base cheese and tomato which is fine by us, as we didn't have to share the deep pan. I'd love to know what you think of the new base, and what your favourite pizza is! 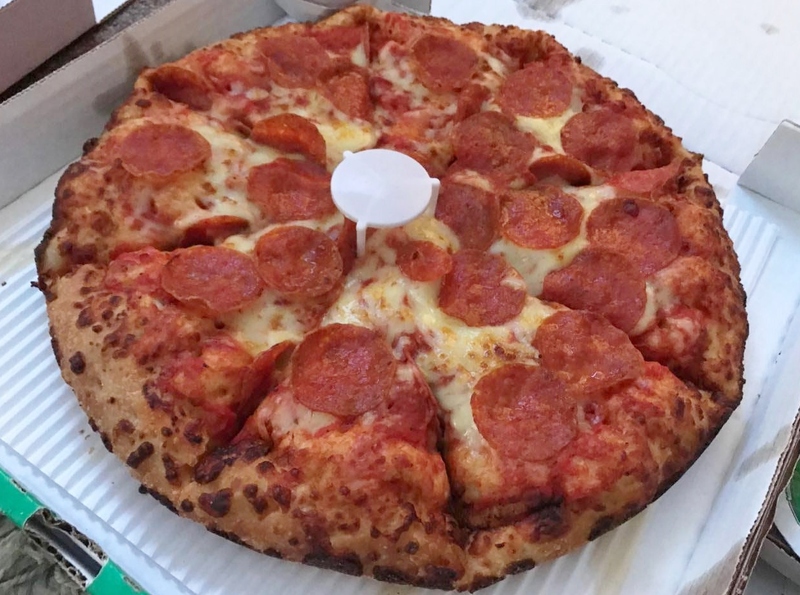 Papa's Deep Crust can be ordered with all the toppings available in the original papa john's range, including 'half and half' and 'create your own'. An even tastier treat, the new Papa's deep crust is on offer until 26th November 2017 from just £10.99 meaning you have the perfect excuse to have a pizza night or family pizza party like we did, and give it a try. pizza is our go-to takeaway! I do quite like thin crust pizzas, but the rest of the family prefer deep pan.